Buyers search the internet for products they are interested in generally via Search Engines. Search Engines (Google, Bing, etc.) list the most relevant websites to a specific search near the top of their search ranking – paid Google AdWords (pay per click) come first. Even though your website features the products being searched for, due to the fierce competition by all businesses internationally, you may not appear on Page 1 of a search. Less than 20% of people will proceed past Page 1 when they are searching. The more comprehensive (relevant) a website is, the better that website will rank on major search engines. Showcase of Aussie Products, by listing a multitude of Australian Made products in a wide range of product groups and by using up-to-date Search Engine Optimisation (SEO) & Authoritive Content techniques to feature your product/s and make it more readily found by your potential customer, may well become the premier site as far as searches for Australian Made products are concerned. Listing your products with Showcase of Aussie Products, coupled with an extensive marketing campaign via Traditional and Social Media will ensure Showcase of Aussie Products will become No. 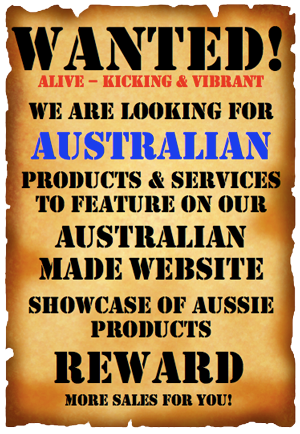 1 on all major search engines for Australian Made or Produced products. By listing your business on Showcase of Aussie Products you will be readily identified as an Australian Manufacturer/Producer and your products will be seen by genuine buyers of Aussie Made/Produced.